In January and February FBEC volunteers guide eagle watching bus tours on Saturday* mornings. Participants should meet at the Cedarberry Inn on Phillips Blvd. (Hwy 12) for a 10:00 a.m. departure time. The tour is one hour long and visits the dam, VFW Park and Prairie du Sac overlook, sites where eagles are regularly seen. Call the Cedarberry Inn at 608-643-6625 to reserve a bus tour. The cost is $5 per person (children 5 and younger are free). These are very popular – Reservations are strongly encouraged. *Please note that during Eagle Days, bus tours are FREE. Bus Tours start at the Sauk Prairie High School. 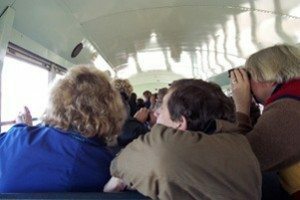 Bus Tours at Eagle Days fill quickly, first come – first served. Sign up at the high school. No prior reservations. Presentation Available on Area’s Wintering Eagles. FBEC volunteers are available to give PowerPoint presentations to area groups. Anyone interested in this service should contact the Ferry Bluff Eagle Council by email. A $100 donation is encouraged. 608-643-6625 to reserve a bus tour. 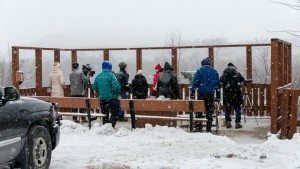 Every Saturday and Sunday in January & February, from 9:00 a.m. – 1:00 p.m., FBEC volunteers greet visitors at our overlook in Prairie du Sac. We answer questions, help people see eagles through spotting scopes, provide information, and steer them to other bald eagle watching sites. Saturday and Sunday mornings we take 2-hour shifts and have fun meeting a wide variety of people. Contact us if you would like to volunteer for “overlook duty”.